It’s hard to find a combination better than freshly caught trout, freshly picked morel mushrooms and crisply fried bacon. 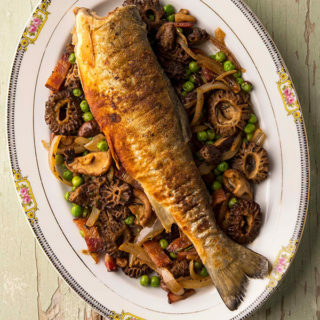 Trout with morels is a classic for a reason, with or without bacon: They can both be picked on the same trip outside, and trout fried in bacon grease is, with or without the morels, one of the great culinary delights of spring. 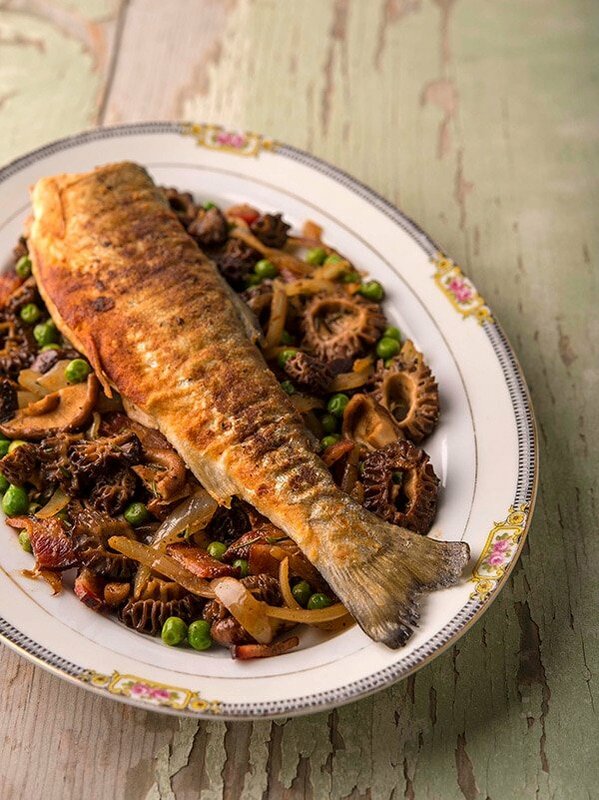 This recipe is a pared-down, more sensible and less fussy version of a similar trout with morels recipe I published back in 2013. You will no longer find that recipe here. I 86’d it because, well, I’d rather you actually make my recipes than just look at them. The old version had bracken fern and ramps and sorrel and was garnished with violets. Cheffy. I’m just not that guy anymore. More and more I am inclined toward less fussy food, to finding recipes that give you a great eating experience without having to somehow procure ingredients even a Michelin-starred restaurant might have trouble finding. Nope, everything in this recipe is easily obtained — except for the morels. Those you have to find, or buy at exorbitant rates in a fancy market. Or, do as I did, supplement a meager days’ haul of morels with small shiitake mushrooms, which are meatier than morels and work well as backup player. 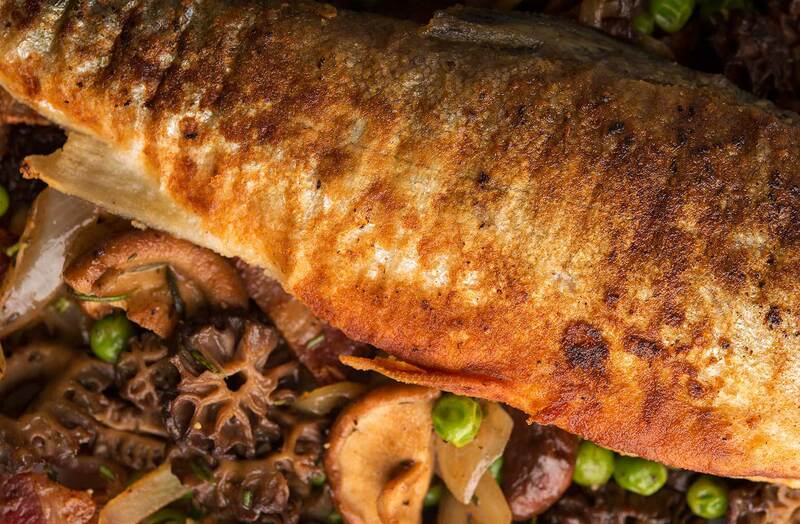 This recipe is still an ode to spring, however: peas, trout, morels, fresh spring herbs. Plus bacon, glorious bacon. They’re all cooked in the same pan you cooked the bacon in, so you don’t even blow up the kitchen. What’s the result? Damn good. Crispy trout skin and bacon. Deep, chewy savoriness from the mushrooms, balanced with sweet peas and fragrant, slightly bitter herbs. A splash of lemon brightens everything up. You find yourself choosing different bites with each forkful: Trout and a mushroom, bacon and peas, trout and onions, etc. I served this with simply cooked wild rice, but any rice, or wheat berries, or hell, bread, or new fingerling potatoes, would be fine. Enjoy! You can use any mushroom you prefer here, and while I like trout on the bone, you can certainly use fillets -- or pretty much any other fish you feel like. In a perfect world it would be any fish you caught in springtime, but hey, try it with whatever fish you like. In a large frying pan, ideally cast iron, cook the bacon over medium-low heat until crispy. Remove and cut into batons and set aside. Turn the oven to "warm" and set a wire rack over a baking sheet inside; this is to keep the trout warm. While the bacon is cooking, salt the trout inside and out. When the bacon is done, coat the fish in fine cornmeal. Turn the heat in the pan to medium-high. When it's good and hot, fry the trout in batches until they are crispy and cooked through, about 6 to 8 minutes per side. You will likely need to lower the heat on the fish at some point -- the key is to listen: The frying trout should sound just like the bacon. A happy sizzle. When they're done, carefully move the trout to the rack in the oven. I do this with two spatulas. Put the onions in the frying pan and saute for a few minutes, until they soften and begin to brown a little. Add the mushrooms and toss to combine. Saute until they begin to give up their water, about 3 minutes, and then jack the heat up to high. Let everything sit for a minute to get a bit of a crust, then toss to combine. Add the peas, the bacon batons, parsley and thyme and toss to combine. Cook just until the peas are warm, about a minute. Serve all this as a bed for the trout and squeeze some lemon over everything right as you serve. NOTE: Fine cornmeal is often sold as "fish fry," and is often in the Cajun section of the supermarket. 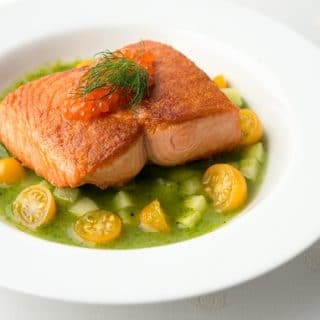 You can find dozens and dozens of salmon and trout recipes here on Hunter Angler Gardener Cook! Chris: Yes, in the Rockies.